Electric Daisy Carnival has already reshaped the electronic music movement in the United States in the past four years. This year, however, EDC Las Vegas will be shattering records with an expected 400,000 people in attendance, to make it the largest EDM event in the genre’s history. Tickets were originally sold out for the event, but more have gone on sale because of the outrageous demand. The face value for a ticket to EDC Las Vegas is $345 plus $40 in fees. A VIP ticket for the weekend costs $599, plus $54 in fees. On the resale market, the average three day pass is selling for $524, roughly 52% more expensive than face value, without ticketing fees. In fact, it almost makes sense to buy a VIP ticket at face value instead of buying a regular pass on the secondary market, because it is only 14% more expensive, and comes with a lot of added amenities for the weekend. Electric Daisy Carnival has been a growing brand throughout the United States since 2011, when SeatGeek started tracking its tickets on the secondary market. The first EDC Las Vegas sold for an average of $193 on the secondary market. Today’s prices are more than 2x the price of 2011. 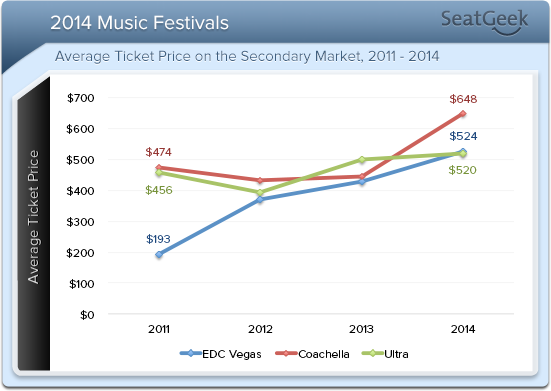 Prices spiked in 2012 for EDC, as an average Vegas weekend pass cost visitors $371. In 2013, a there day pass cost an average of $427, a steady incline each year. The EDC brand has grown throughout the world as well. In 2014, EDC will host events in Las Vegas, New York, London, Puerto Rico, Orlando, and Mexico. New York tickets are the second most-expensive, averaging $228 for a weekend pass in 2013, and $267 for a three-day pass in 2012. Two other music festivals that compete with EDC are Coachella in Los Angeles and Ultra Music Festival in Miami. While the 2014 average price for EDC is $524, the average Coachella price for 2014 was $708 for the first weekend, and $588 for the second weekend on the secondary market. Ultra, on the other hand, is fairly comparable to EDC, with the average 2014 ticket reselling for $514. In 2013, the average Coachella ticket cost $526 for the first weekend, and $364 for the second. Ultra cost visitors an average of $321 in 2013. EDC Las Vegas cost $427. One benefit of music festivals is that it allows guests to see an extraordinary number of acts while saving an enormous amount of money. There are going to be 187 DJs at EDC this weekend, which means that visitors will pay an average of only $2.80 to see each performer, if they bought their tickets on the secondary market. Because music festivals spread out the most popular acts over all three days, each day has some very popular performers. The first night features Afrojack, Hardwell, and Steve Aoki. Afrojack tickets sell for an average of $211 on the secondary market, Hardwell tickets sell for $90, and Aoki tickets sell for $116. Seeing those 3 acts individually would cost $417, 80% of the total ticket price for EDC. The second night features Avicii ($96), Martin Garrix ($152), and Tiesto ($281), which totals $529, more expensive than a weekend pass to EDC on the secondary market. Therefore, it is clear that going to EDC, or any music festival for that matter, saves a lot of money.